There are many types of tattoos that have a rich history and a very symbolic meaning. 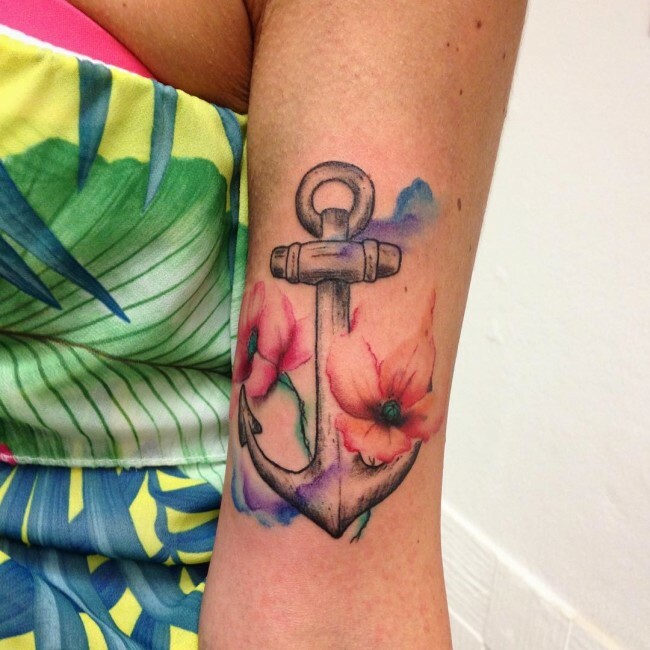 One of the most common tattoos is the anchor tattoo. This tattoo has been applied over the years and currently, it stands among the most applied. Originally, the anchor was used to symbolize a surface that crosses the Atlantic Ocean by the ship. Also, the anchor was linked to the Ancient Christian Church. The early Christians were associated with the anchor. For that reason, it was used to conceal the cross. The ancient Christians used the anchor along with the cross, to hide their identity. This was to avoid the persecution that was carried out by the Greeks. Also, the anchor symbolized their strong foundation in Christianity. It was later on that the anchor was used by the sailors. 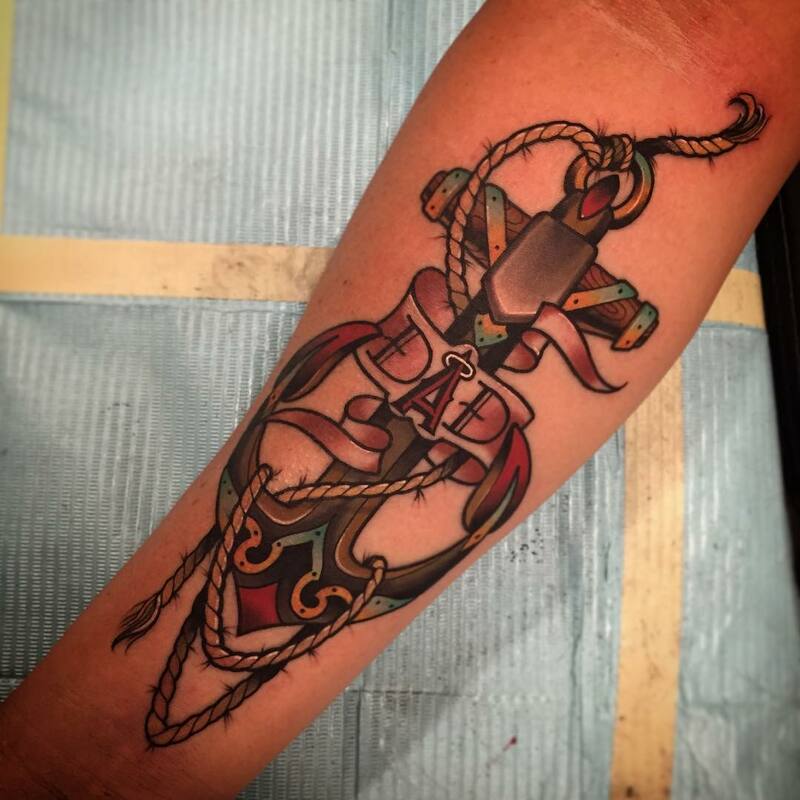 The original meaning of the anchor design tattoo tends to be slightly different from the current meaning. All in all, there deep meaning is stability and a deep foundation or a strong basis on anything. It can be used to symbolize stability and strength. This is because the anchor is usually thrown down to hold on to the base and roots of the sea. Such a tattoo can be used to show that a person is held in place by something. Also, it can be used to offer you strength to hold on to whatever you are interested in. It can act as an inspirational symbol. The tattoo can also be used to remind people about their need to have courage and confidence. Some might have the tattoo to symbolize that they are not easily movable. They can stand strong and nothing can get them off from what they believe or want. There are some people that will use the anchor symbol, just for its aesthetic aspect. Some will not really have an exact meaning of the anchor symbol. This is because some anchor symbols tend to be applied with different designs and color blend. This makes them look stunning and others can also receive it in a more positive way. 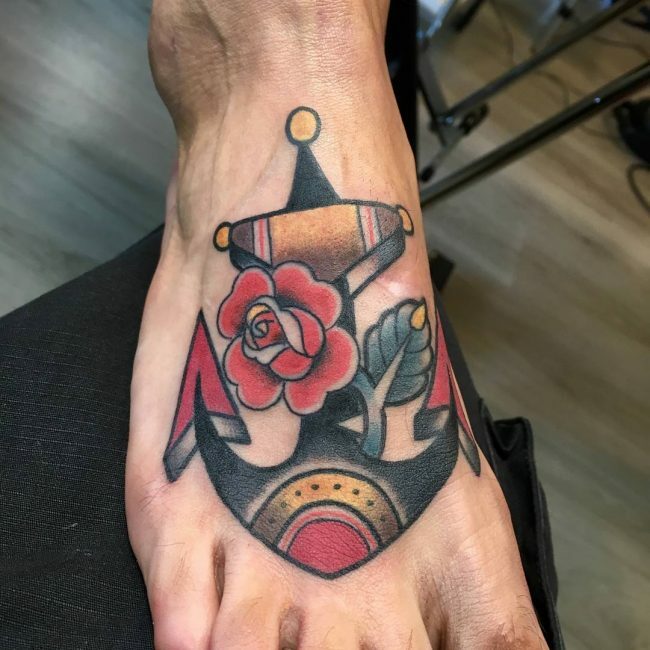 In general, the anchor design tattoo has a lot of meanings. Whatever the meaning your tattoo might have, you will be sure of enjoying its display and it can help to keep you moving on. The placement of these tattoos is very flexible and there is no any restriction or limitation. Since they will come with a different design, style and size, the placement will vary. If the tattoo is detailed and has a lot of decorations, it will be placed where there is more skin. Also, if the tattoo has more than just an anchor, it will also be placed on a bigger surface area. This applies to those that choose the tattoo as an aesthetic symbol. The gender will also affect the placement of these tattoos. Some of the most common areas of placement include the wrist, chest, back, arm, ankle, shoulder, fingers and the back of the hand. There is basically no limitation in the area of placement. Some even choose to have it at the back of the ear, others on the neck, while others along the collar bone. They can also be applied on the calf, the leg, thigh and the ankle. Regardless of the place that you want to place your tattoo, you will want to ensure that you choose wisely. 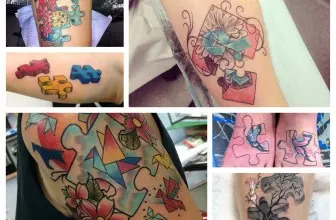 You might want to contact a professional tattooist to help you in choosing it right. 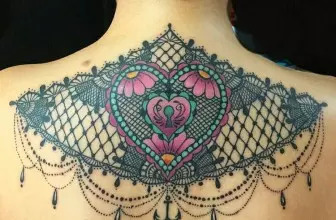 There are many types of these tattoos, which are applied with different style and design. The only common thing among them all is the original shape of the anchor. Some will be designed with other symbols to have a deeper meaning. With this tattoo, it will have a combined meaning. The anchor symbolizes passion, determination, and strength. On the other hand, infinity symbolizes something that is endless or one that keeps on going. For that, it can be used to show that one is will always stay strong or that they can never be shaken by any situation. It is a common tattoo symbol for love. This type of symbol is also called the Old-School anchor. They are the original anchor designs that have been used for many years. These anchor designs are bigger and they will mostly have solid colors. They can be used to symbolize the default meaning of the anchor. Also, they can be used by those working in the sea. These ones will mostly be represented by an eagle, a globe, and an anchor. 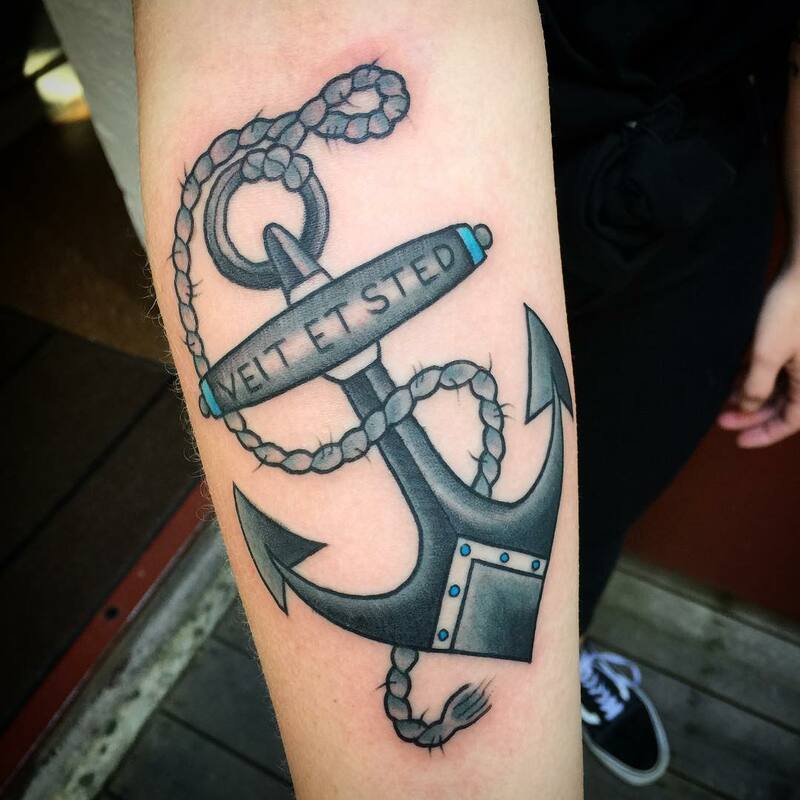 Others will have a basic anchor, with a huge NAVY word written on it. They are commonly used by the US Marine Corps and they have a collection of meanings. The symbol of the eagle will signify patriotism, the globe, on the other hand, will represent the dedication to the Marine work. The tattoo can be used to symbolize an unwavering fidelity. You can have the tattoo of an anchor and a wheel, which will symbolize a change in the direction of a person’s life. It can also be used to symbolize hope in the life of a person. The tattoo could mean that the person has a way in their life to follow, but they still need guidance. This tattoo will have a heart and an anchor, to show that the person is rooted deeply in love and that they are immovable. It can be used by lovers or people that are close enough. This is also a great option that will entail a rope and an anchor. This can be used by the US Navy and also, it tends to be more masculine. This one will be similar with the couples and the placement will also be similar. They can include hearts or just similar anchors that have the same exact details. This tattoo will entail roses and it will generally look elegant. It will be used to symbolize honor, sacrifice and love. They can be used by women and will generally have a feminine look. You can have customized letters that are designed to take the shape of an anchor. The words will vary from one tattoo to another.